People have always told us at Coffey Strong that recovering from the fires would be a marathon, not a sprint, and it would take many months or even years to restore our neighborhood and our park. What we have done, and have yet to do to for rebuilding is overwhelming. But all of us have received blessings along the way too, as our local community rallied to help, bringing their hearts and hands, talents and resources to help us to that finish line. Yesterday was one of those hope-filled days where we were on the receiving end of so much kindness. 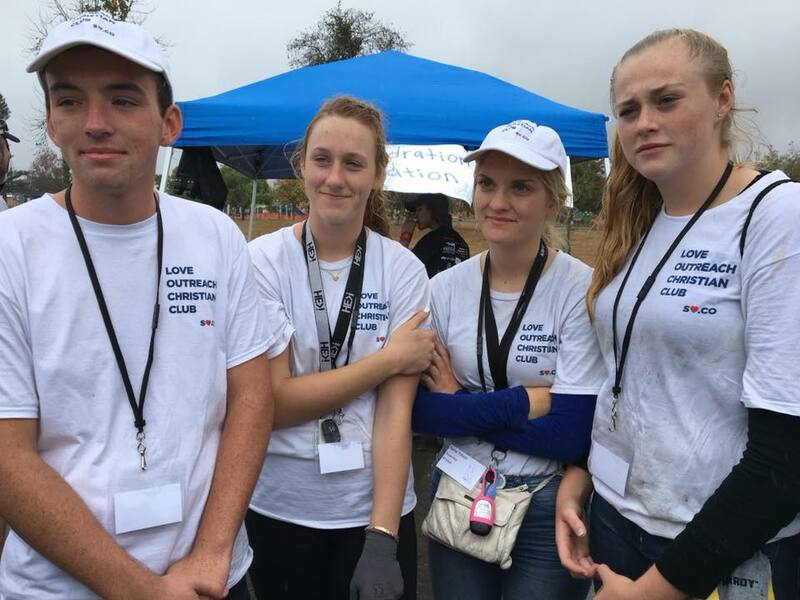 When local high school students Turner Welch, Katie Todd, Rene Tolson and Elena Dyer returned to their school this year, they had a vision for making community service projects a new part of their high school Christian Club activities schedule. 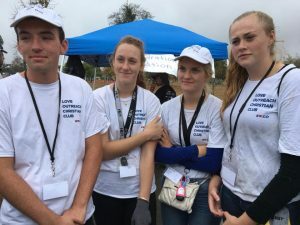 But realizing that their clubs at Maria Carrillo and Windsor High were small and had a limited capacity to serve, they decided to reach out to other high school clubs to create a larger organization, a group they call the Love Outreach Christian Club. “We came together with a mission and a passion for the community and a desire to share God’s love.” said Todd. They knew that by coming together they could achieve so much more. And they started it off with their first project– a clean up day in our fire-ravaged neighborhood, Coffey Park. 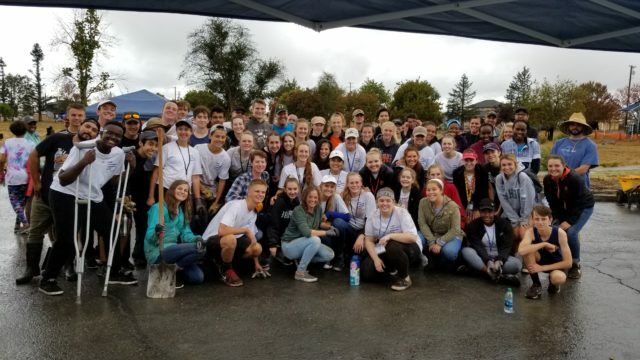 Using their connections at local churches and social media to spread the word, they never imagined how this idea would grow so quickly to bring in 250 volunteers from as far north as Ukiah, representing at least 8 schools. They welcomed anyone who could help to pitch-in, not just Christian Clubs or church groups, but any person who was interested in helping out. 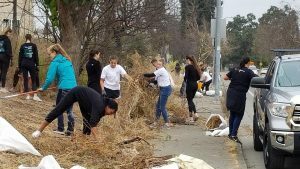 For example, more than 40 seventh and eighth graders from nearby Mark West Charter School, were there to volunteer, representing a quarter of that small middle school’s student body, and many adults came to participate as well. water for the volunteers, and get supplies like debris collection bags. Teen organizers met with Coffey Strong board members Bill Northcroft and Tricia Woods several times to define the scope of the project and figure out what tools, materials and resources were needed for the day. According to Woods, the kids simply gathered the information and then set to work making the preparations themselves. 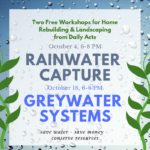 Local builder Shook and Waller provider heavy machinery to facilitate big cleanup efforts, and Recology donated the dumpsters. 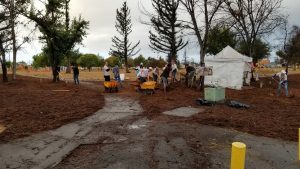 Another donor provided $3000 worth of mulch, and many others pitched in with tools, wheelbarrows, tables, chairs and more. The first priority was to clean up the area along Dogwood Drive and the park, which was still littered with burned and twisted heaps of metal debris, overgrown organic waste and trash. Neighbors have been complaining to the city about this area for months, and now was a great opportunity to remove the mess. The second priority was to clean up the intersection of Coffey Lane and Hopper Avenue, what many are now referring to now as the ‘Entrance to Coffey Park’. Northcroft has been leading an effort to install new permanent landscaping on those corners, but until the funding for that project can be raised, the area needed deep cleaning and sprucing up. The teens cleared the area, weeded, laid down mulch and even planted a few flowers near the newly installed neighborhood sign on the northwest corner. The facelift to this area comes just in time, as this location will be the site of a 1-year Remembrance Gathering for Coffey Strong, scheduled for 7 PM on Tuesday, October 9. Adults from local churches and Coffey Park neighbors were there pitching in to help, under the direction of the teens. 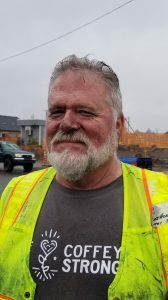 Kerry Lane neighbor Tom Fellbaum helped unload wheelbarrow loads of green waste into a 30 yard dumpster, and neighbor Lyn Johnson grabbed a rake and helped clean up along Mocha Lane. 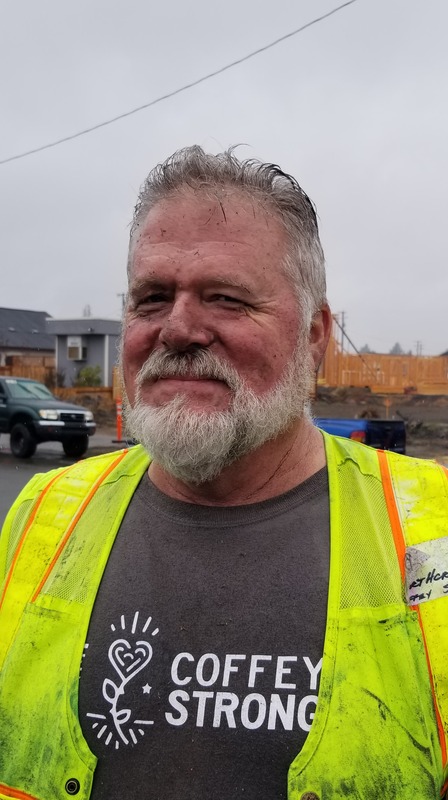 Folks like Travis Oglesby offered the use of his pick up truck and neighbor Steve Rahmn helped make runs to the dump with debris. Other neighbors felt compelled to come and simply say thank you to the kids who organized and spent their Saturday volunteering. Debbie Bratburg, an elementary school teacher from Windsor who lost her home directly across from the park wanted to speak with the organizers and let them know how grateful she is, and how hopeful and proud she is of these young people. The teens say this is just the beginning, and that they are planning community service projects both large and small in the year ahead–from River Clean ups to food bank volunteering. They look forward to more opportunities for young people to take the lead for positive change in the world. 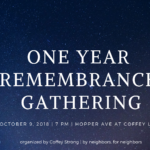 “We want to set aside our differences, forget about conflicts, and work together to rebuild our community after the tragedy of last October.” said organizer Tolson. Coffey Strong is working hard to bring back our neighborhood, including our lovely local park. It will take millions to restore, since all the irrigation and play equipment was destroyed by the intense heat of the fires. If you are able, please help us with a donation to the park rebuilding fund or other projects from Coffey Strong! Information on how to contribute is on our website’s fundraising page.